TheBusinessDesk.com’s Property networking lunch returns in May, when it will welcome one of the region’s most influential professionals as the keynote speaker. Guy Gusterson has held senior roles with St Modwen for more than a decade and is now its property director for Midlands and North. The stock market-listed developer has embarked on a radical shift in strategy in the last two years as it sought to respond to a rapidly-changing property market. 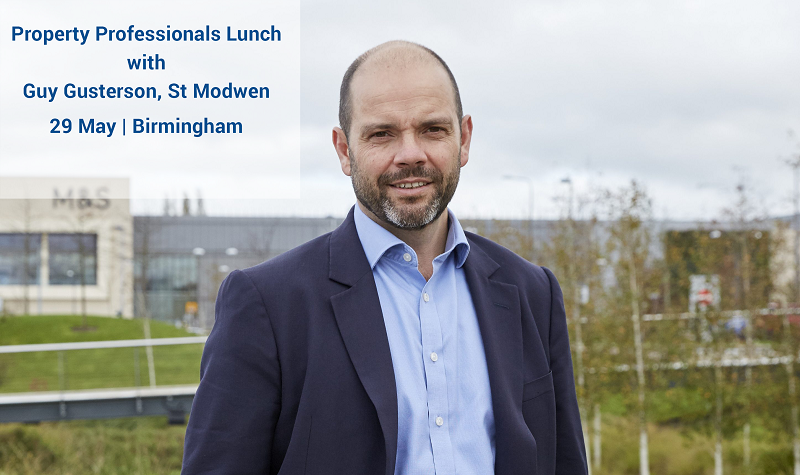 Guy will discuss how the new strategy is developing, what St Modwen is putting its focus on in the region, and where he sees the opportunities and challenges in the years ahead. Previous speakers at TheBusinessDesk.com’s property lunches, including Waheed Nazir, Paul Bassi and Andy Robinson, have attracted around 100 professionals from across the sector. The two-course lunch, including a welcome drink is at the Hyatt Regency Birmingham, next to Arena Central. Networking is from 12pm with lunch beginning at 12.30pm.